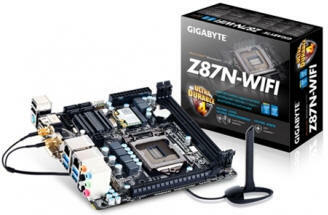 Enabling small system designs, Intel's Next Unit of Computing Kit DE3815TYBE offers performance for Embedded Devices and more. 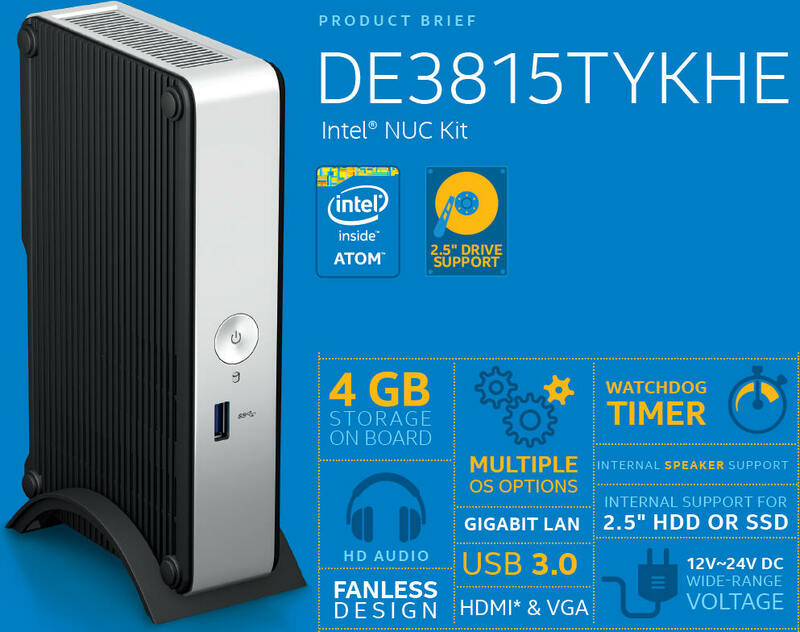 The Intel NUC Kit DE3815TYKHE, built with an Intel Atomprocessor for intelligent systems, is a pint-sized powerhouse for value-conscious businesses and organizations. 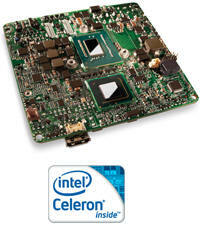 This low-cost, low-power solution introduces many firsts to the Intel NUC form-factor: fanless thermal solution for the ultimate silence and reliability, onboard flash storage for small-footprint software solutions, internal flat panel display connectivity for built-in screens, video graphics array (VGA) port for monitor compatibility in legacy installations, serial ports header for peripherals requiring the robustness of hardware handshaking, watchdog timer for resilient system availability, and also inter-integrated circuit (I2C) and pulse width modulation (PWM) signals for interfacing with sensors and other embedded devices enabling the Internet of Things. And with its three-year supply availability, the Intel NUC Kit DE3815TYKHE will be around to support long development and production ramp cycles. 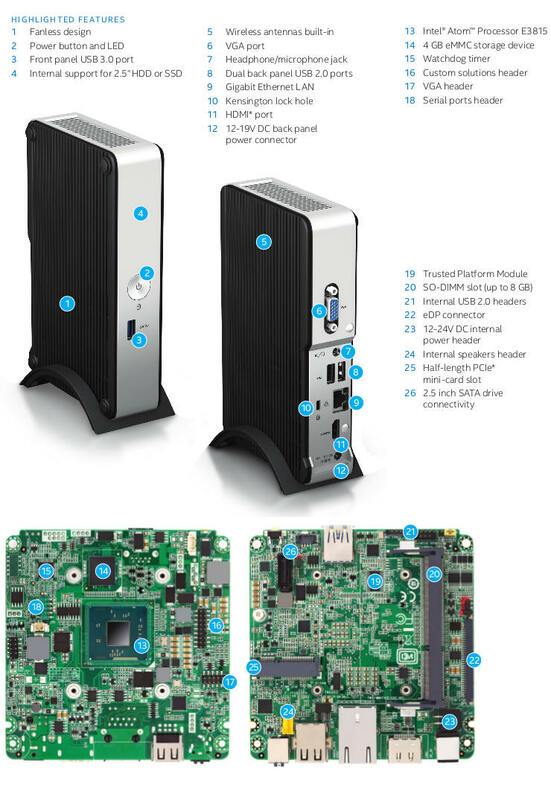 With its vertical industrial design and support for Linux* and Windows* Embedded operating systems, this Intel NUC was designed as the essential building block to power the thin-client market. A fanless kit with flash storage built in, and USB3 and audio headset support, this Intel NUC fits right at home in schools, call centers, and other locations with a large installed base of VGA monitors. Powered by the Intel® Atom™ processor E3815, the Intel NUC Kit DE3815TYKHE also provides an ideal combination of power consumption, performance, affordability, and software compatibility to drive light digital signage, point-of-sale, and kiosk solutions, amongst other usages. 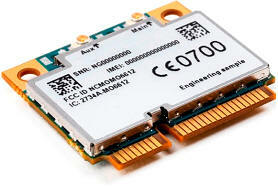 With 4 GB of Embedded MultiMediaCard (eMMC) storage built in, many embedded applications will benefit from a lower overall system-level BOM cost. Incidentally, high availability resilience can also be enabled for these and other unattended solutions via the built-in watchdog timer, providing priceless protection against costly and embarrassing downtimes. Last, but certainly not least, this Intel NUC provides a discrete Trusted Platform Module device onboard for hardware-based data encryption—a must-have for applications where confidential information is at stake. 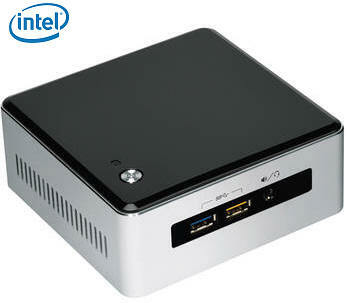 Embedded possibilities are endless with the Intel NUC Kit DE3815TYKHE—just add RAM! 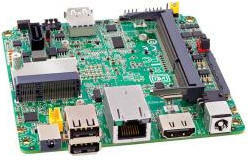 The 4 GB eMMC embedded storage on the Intel® NUC Kit DE3815TYKHE and Intel® NUC Board DE3815TYBE can be used for small-footprint operating systems, as typically used for thin-client and light-embedded applications. Please check your OS minimum requirements before attempting to install an OS to this device.